The contents of header widgets appear at the very top of the page, above the logo/heading. You can choose to place navigation menu(s), social media links, or a search widget here. Inside the left header, you might want to insert a few handy links, for example a Contact Us button. In order to set up a custom menu for this area, you can go to Appearance > Menus and click Create New Menu (for example "Top Left") at the top. For more information on how to create menus, please read https://codex.wordpress.org/WordPress_Menu_User_Guide. Now go to Appearance > Widgets then drag and drop a Navigation Menu widget into the widget area named Header - Left. 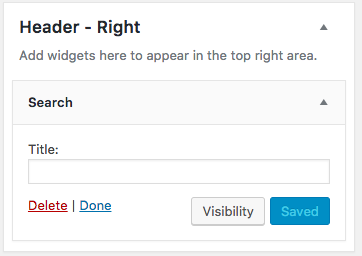 In the widget settings, and select the menu, for example "Top Left", that you would like to see in the left area of the header. In the demo, you can see social media links above the logo. 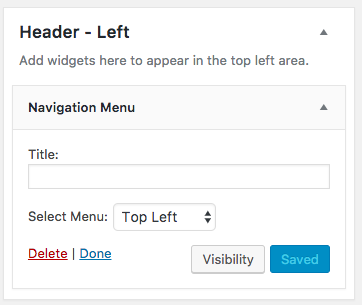 In order to set them up, go to Appearance > Widgets then drag and drop a Navigation Menu into the widget area named Header - Center. Then, select the Social menu, and save the settings. 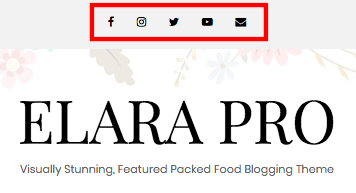 More information on setting up social media links can be found here. For this area, we have designated a search plugin. In order to activate it, go to Appearance > Widgets, then drag and drop a Search widget into the area named Header - Right.